COLLEGE STATION, Texas — Virginia Tech Director of Athletics Whit Babcock confirmed on Wednesday that men's basketball head coach Buzz Williams has accepted the same position is leaving the Hokies to take the same position at Texas A&M. "Coach Williams made a very positive impact on the culture of our basketball program at Virginia Tech," Babcock said. "We appreciate all that Buzz and his staff did for our students and our program. We wish Buzz, Corey and their family the very best as they return to their home state of Texas. "Thanks to our talented student-athletes, Coach Williams and his staff, Virginia Tech is now one of the most attractive jobs in the nation's top basketball conference, the ACC," Babcock continued. "I'm extremely confident that we'll be able to identify and hire a new head coach who can further build on the success our men's basketball program has achieved in recent years. Until we have our new head coach in place, we will have no further comment on our search process." "Coach Buzz Williams has been a true Hokie and a leader both on and off the court," Virginia Tech President Tim Sands said. "I appreciate his commitment and character, and the significant contributions he made to the team and the university. We will miss him and we offer our sincere thanks and wish him well as he moves on to his next opportunity." The event is free to attend and parking in all Reed Arena lots is free as well. Fans can enter through the West, Main and North entrances, and the first 2,000 will receive a free The Buzz is Back t-shirt. After inheriting a program that went 9-22 overall and 2-16 in ACC play before his arrival in 2013-14, Williams led Tech to four consecutive 20-win seasons, four postseason tournament berths and three straight NCAA tournament appearances, including a Sweet 16 berth in 2018-19. The Hokies won a school-record 26 games in 2018-19, finishing the season with a 26-9 overall record and a 12-6 mark in ACC play. In total, he compiled a 100-69 overall record at Tech, including a 66-22 mark at Cassell Coliseum. 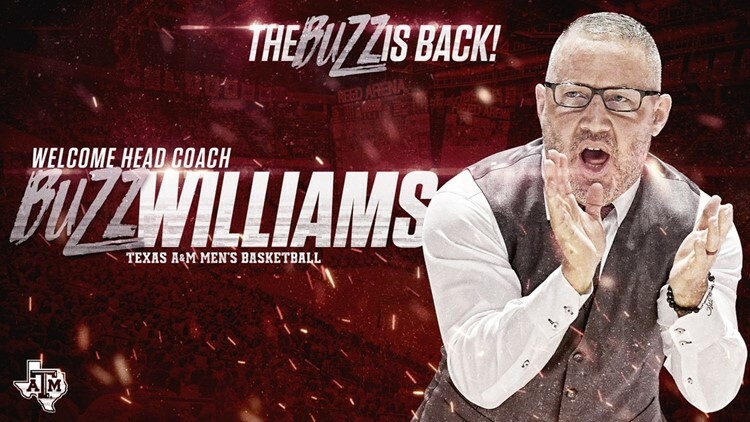 In 12 seasons as an NCAA head coach, Williams owns a 253-155 record that included a 139-69 ledger and five NCAA Tournament berths in six seasons at Marquette, as well as a 14-17 mark in one season at the University of New Orleans. In addition to their contributions to the Hokies' men's basketball program Williams family has also left a lasting legacy in Blacksburg with two Virginia Tech scholarship endowments. The Buzz's Bunch Scholarship Endowment will continue to be awarded annually to an undergraduate student at Virginia Tech in any field of study who is registered with Services for Students with Disabilities. Buzz's Bunch is a non-profit organization that the Williams family created at Marquette and continued at Virginia Tech as a way to bring children with disabilities and special needs together and allow them to fall in love with the game of basketball. This endowed scholarship further strengthens the longstanding pledge the Williams family has made to help those with disabilities and special needs reach their full potential. The Buzz and Corey Williams Family Student-Athlete Scholarship – In Memory of T. Marshall Hahn will be continue to be awarded annually to an undergraduate student-athlete participating on any women's intercollegiate teams at Virginia Tech. First preference shall be given to students who are the first generation of their family to pursue a post-secondary (college) education. Preference shall also be given to students who are members of an underrepresented population at Virginia Tech. This scholarship recognizes Coach Williams' deep appreciation for his friendship with the late Dr. Hahn and the many initiatives he championed during his tenure at Tech to develop a culture of diversity and inclusion for all Hokies.